Nubian Heritage Launches 3 New Collections! Cult beauty brand, Nubian Heritage, has launched three new collections of hair care with natural and certified organic ingredients. Where can you go to get your hands on the collections? You can conveniently find them at Walgreens and select Target and CVS stores. You may have seen Nubian Heritage’s colorful bath and body care collections, including its famous African Black Soap, on the shelves of Whole Foods, Wegmans and Vitamin Shoppe. A company with a unique beginning, Nubian Heritage’s story is a humble one, with two partners making natural soaps and lotions using recipes carried down from founder and CEO Richelieu Dennis’ family. Dennis and partner Nyema Tubman sold their wares all over New York City as street vendors. Nubian Heritage’s popularity boomed, and its beloved bar soaps and other creations made their way into stores across the country. Dennis, a pioneer of utilizing exotic, certified organic and fair trade ingredients from around the world, knew his next calling was to create a range of salon-quality, natural hair products. His mission was to create hair care that went beyond the cleansing, styling, texture and maintenance needs, to therapeutically address core issues caused by prolonged use of products made with harsh chemicals, excessive heat styling and harsh environmental conditions. 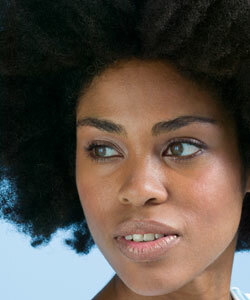 These issues include scalp irritation, breakage, hair loss, brittleness, dryness and buildup. He continued the company’s 20 year tradition of using globally-sourced raw materials, cultural healing regimens and traditional refining processes in his treatment, maintenance and styling products. 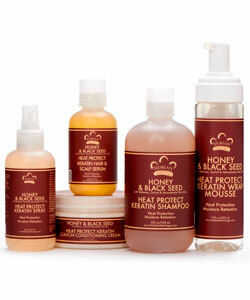 This collection helps to strengthen hair and promote growth, while minimizing breakage and shedding. The products contain high percentages of hemp, which calms scalp irritation and Tamanu Oil from Madagascar, with natural antiseptic, moisturizing and reparative benefits. Bamboo is added to strengthen hair, based on Chinese beauty rituals, while Garlic Extract is included for encouraging growth, as used by naturopaths in the Mediterranean. Finally, naturally fragrant Monoi Oil, a beauty secret from Tahiti, intensely hydrates hair, preventing breakage. The collection aids in keeping color vibrant and perms fresh — naturally. Coveted in ancient Ayurvedic hair treatments for its rejuvenating properties, the products are rich in Moringa Oil, which contains oleic acid, antioxidants and vitamins that aid in repairing split ends and conditioning hair. Extra Virgin Olive Oil bathes hair in fatty acids that provide moisture and brilliant shine. Henna offers natural color enhancement and sheen, while naturally thickening hair strands and Quinoa provides a protective barrier over the hair shaft. Designed to shield hair from heat styling without harsh chemicals, the collection contains Arabian Honey, which helps moisturize and protect the hair and scalp due to its high concentration of proteins, natural enzymes and amino acids. Black Seed Oil, also known as “Seed of Blessing” and found in the Tomb of King Tutankhamen, is used to balance hair and scalp with its anti-inflammatory and healing benefits. Babassu Oil contains fatty acids and has been traditionally used in Brazil to strengthen hair and preserve elasticity. Macadamia Nut Oil, used by Australian aborigines on hair for thousands of years to replenish moisture — it deeply hydrates, while Keratin nourishes hair, leaving it smooth and silky.